Break the coconut and save the coconut milk. Detach the pulp from the shell and pare off the brown skin. Cut the pulp into small pieces and blend them in an electric blender with all the other ingredients. Add enough coconut milk or water to make the mixture smooth. If you don't have blender, grate the coconut and use a mortar and pestle or a grinding stone to make a smooth mixture. As an alternative to coconut milk or water, you can use 1 1/4 cups (300 milliliters) yogurt, which gives a creamier texture. 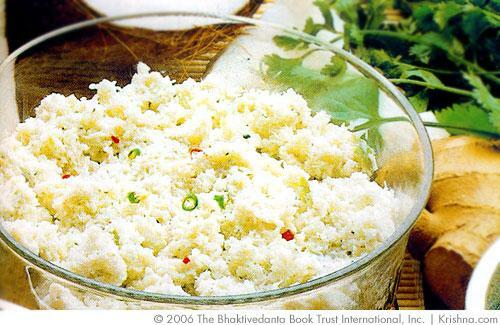 Submitted by saikat sen (not verified) on Sat, 05/28/2011 - 13:05.
coconut chutney is a very good appetizer.